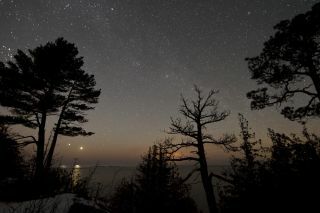 Skywatcher Shawn Malone took this photo of Venus and Jupiter at Eagle Harbor, MI, with the planets setting over Lake Superior, on March 10, 2012. Venus and Jupiter have been lighting up the sky together for the past few days, and observers around the world are snapping spectacular photos of the celestial show. After dancing toward each other in the sky for months, the two bright planets finally come together tonight (March 13) in what's known as a conjunction. At their closest point this evening, they'll be separated by a scant 3 degrees as they hover above the western horizon. (Your clenched fist held at arm's length covers about 10 degrees). Skywatchers around the globe have been documenting this planetary tango, taking stunning pictures of the pair blazing brightly in tandem. Jupiter and Venus light up the sky over Tallinn, Estonia, in this photo by Karthikeyan VJ, from Chennai, India. The planets highlight a serene photo taken by Jim Gemmel on March 10, though a feathered interloper made a play to steal the show. "I planned to use the lake as a backdrop but was pleasantly surprised to see the swan who lives there literally get into the picture too," Gemmel told SPACE.com. Jim Gemmel of Warrenton, Va., took this picture of Venus and Jupiter on March 10, 2012. "I planned to use the lake as a backdrop but was pleasantly surprised to see the swan who lives there literally get into the picture too," Gemmel told SPACE.com in an email. Jupiter-Venus conjunctions are fairly special events, occurring just once every 13 months or so. And this year's is a particularly impressive one, experts say, because the two planets blaze so brightly and are visible for such a long time over the western horizon. The show isn't over after today, either. While Jupiter and Venus are fixing to go their separate ways in the sky, they'll remain quite close together for a few days yet. On Wednesday (March 14), for example, they'll be just 3.1 degrees apart; by Thursday, the gap between them will have widened to roughly 3.5 degrees. Though Venus is much smaller than the gas giant Jupiter, it's far more luminous in the sky because it's much closer to Earth. Our planet orbits the sun at a distance of 93 million miles (150 million kilometers), a span defined as 1 astronomical unit (AU). Venus is just 0.72 AU from the sun, while Jupiter orbits at an average distance of 5.2 AU. Jupiter and Venus (right) setting behind the Flatiron Mountains near Boulder, Colorado, with the peaks of the Continental Divide in the distance. Skywatcher Patrick Cullis took this photo on March 9, 2012. While Venus is winding down its dance with Jupiter, skywatchers should make sure to check back in with the hellishly hot planet a few months from now. On June 5, Venus will cross the sun's face from our perspective, appearing as a tiny black dot. Such Venus transits are exceedingly rare events; after June 5, the next one won't take place until 2117. If you snap an amazing photo of Venus and Jupiter, or any other skywatching target, and would like to share it for a possible story or image gallery, please contact SPACE.com senior writer Mike Wall at mwall@space.com. You can follow SPACE.com senior writer Mike Wall on Twitter: @michaeldwall. Follow SPACE.com for the latest in space science and exploration news on Twitter @Spacedotcom and on Facebook. The Best Hubble Space Telescope Images of All Time!